Tim Tebow is a Denver Broncos quarterback. 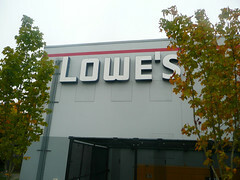 Lowe’s is a home improvement chain. It would seem that even the six degrees of separation couldn’t find a connection between these two. But they do share something in common. Tebow, you see, gets a lot of hate. So does Lowe’s. Why do people hate Tebow? Oddly, no one is exactly sure why. Many mock his imperfect quarterback mechanics. In Denver’s Week 15 game against New England, Tebow’s form was compared to Patriots QB and former MVP Tom Brady. TV commentators explained the differences between the two. But many athletes do not have perfect mechanics. Have you ever seen the Bulls’ Joakim Noah shoot a basketball? His form looks like my eight-year-old’s. Or sticking with football, San Diego QB Philip Rivers also has what many consider an unorthodox throwing motion. Yet nobody mocks either of those players (or the multitude of other athletes whose form does not match up to the “ideal”)…or at least not to the volume of those mocking Tebow. Similarly, many highly-touted NFL QBs with perfect throwing mechanics have become monstrous busts (Ryan Leaf, anybody? ), so analyzing a player’s fundamentals is a fool’s way of judging him. Others have openly stated their hate of Tebow’s competitive desire to win. Well, that doesn’t make much sense either. Michael Jordan was (and still is) one of the world’s most intensely competitive athletes and was much less respectful than Tebow of his opponents during his quest to win. Yet MJ was widely adored, not hated. But the most-cited reason for hating Tim Tebow is how open he is about his Christian faith. Tebow kneels in prayer (mockingly called “Tebowing”) and deflects any praise to Jesus. Atheists apparently would rather see athletes be ego-maniacs than be humble. Ironically, in a way, the Tebow haters (or, in reality, Jesus haters) are making Jesus’s prophecy come true. Christ said that His followers would be hated for His name’s sake. Indeed, when Tebow dares to mention Jesus when being interviewed, anti-religious zealots start firing steam out of their ears and blathering about how dare Tebow mix religion and sports. Tebow is, by all accounts from people who have actually met the man, a genuinely caring and compassionate person. That is, someone who walks the talk. The Detroit Lions’ Ndamukong Suh, who intentionally clubbed people from behind, ripped off opponents’ helmets, banged opponents’ heads into the ground, and stomped on people’s bare arms with his metal cleats raises significantly less ire than Tebow. Huh? Lowe’s has been called “bigoted, shameful and un-American” as well as “profoundly ignorant” by California Sen. Ted Lieu. Hip hop mogul Russell Simmons supposedly bought out the remaining advertising time for the show, which follows five Muslim families living in Dearborn, Michigan and the “misconceptions” they face, and called for a boycott of Lowe’s. But wait, there’s more. Sen. Lieu has even threatened “legislative remedies” if Lowe’s would not apologize. Wow. As blogger ladyliberty1885 astutely wrote in her own Minor Insight, Sen. Lieu is wanting to criminalize criticism of Islam. This is a slippery slope towards communism, where those in power dictate what is acceptable speech and differing opinions are not allowed. If hate speech legislation proponents get their way, this will become a frightening reality. People have apparently forgotten that the 9/11 attacks were done for the cause of Islam. And this is not “extremist” or “radical” Islam, as many politically correct journalists like to point out; this is traditional Muslim orthodoxy. The plain reading of the Koran (Quran) states that non-Muslims must be killed. In other words, “extremist Muslims” are normal Muslims. The true extremist Muslims are the non-violent ones b/c those are the ones ignoring the plain reading of the sacred Islamic texts. Yet Lowe’s is the one facing backlash instead of this show perpetuating propaganda that Muslims are peaceful teddy bears. This show is a Trojan horse and has the support of the Council on American-Islamic Relations (which itself is a Trojan horse for the Muslim Brotherhood in America). So an American Christian gets hate for expressing his faith while American Muslims get love for expressing theirs. You’d think it was in the name of Christianity that hijackers attacked the Twin Towers on 9/11. What a scary and twisted nation we live in these days. Waiting for Sen. Lieu to call Tebow haters “bigoted, shameful and un-American” as well as “profoundly ignorant” and institute “legislative remedies” if Tebow haters don’t apologize. Wait, you’re saying he won’t do that? Contact Sen. Lieu and tell him you won’t accept his warped logic and abuse of political responsibility (thanks to ladyliberty1885 for the below info). If you live in Sen. Lieu’s district, you can email him. While you’re at it, contact Lowe’s and let them know you support them. Even better, go out and buy stuff at Lowe’s instead of Home Depot!